In the last decade, Sikkuy has been active in the area of housing, planning and construction in Arab localities, with the aim of expanding the supply of housing in Arab towns and regulating existing construction. The housing shortage in Arab communities is due to continuing discrimination by the Israeli government and a restrictive planning policy with long term disparities compared with housing in Jewish communities. A scrutiny of spatial planning in Arab towns reveals a series of barriers preventing or shrinking the development of these communities and their ability to flourish and to offer their residents high-quality, sustainable spaces. About forty thousand structures, in recognized Arab localities in Israel, are today under threat of demolition on grounds of having been built without a permit; the areas designated for development have not expanded significantly for many years; master plans do not provide solutions for population growth; and the Arab communities suffer a shortage of state land available for building – a situation which limits the possibilities for development of residential neighborhoods and public facilities. All these factors lead many Arab citizens to build outside residential zones – on land they own but which is designated for agriculture. This limits the local authority’s ability to provide services and also limits the volume and quality of open spaces for use of the residents. In recent years, the government has acknowledged its failure to manage the issue of housing in Arab towns. At the end of 2014, the government created a team called The 120 Days to find a solution to the housing shortage in Arab society. Sikkuy participated in the meetings of this team and proposed solutions to the existing problems. In December 2015, some of the 120 Days team’s conclusions were included in the housing section of Government Decision 922, the focus of which was subsidized infrastructure development and allocation of budgets for master plans and detailed plans. Sikkuy works with the relevant government ministries and assists Arab local authorities in promoting successful implementation of the government decision and the advancement of housing solutions for the Arab community. Our research mapped the existing barriers and provided the foundation for our efforts to promote effective policy recommendations – to improve marketing and development of land in Arab localities, and to aid the Arab local authorities to move forward with master plans for their towns that can meet their residents’ needs in housing, transportation and new day care centers. Wajde Halileh joined Sikkuy in August 2017 as the Housing Project Coordinator in the Equality Policy Department. 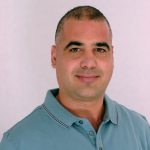 With a degree in architectural and building engineering from the Technion, and RICS certification, Wajde worked in several positions at the Arab Center for Alternative Planning, in private architectural firms and in the engineering department at the Majd el Krum municipality.